In Isafjördur in the Westfjords of Iceland, people partially live of the fishing industry. And dried fish from Isafjördur is a specialty. In the winter, fish drying happens in slatted huts on land at the coast. But in the summer time flies would be all over the fish before it dries. 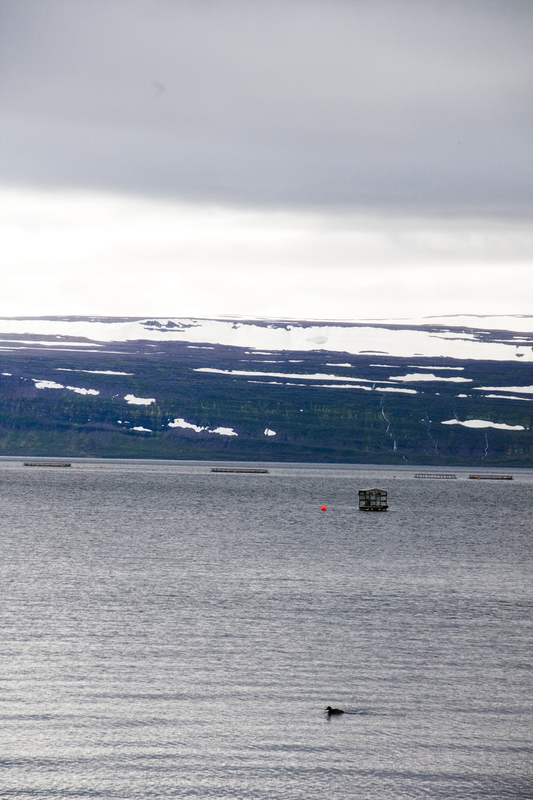 Therefore there are drying huts that swim out in the bay of Isafjördur. They are further out than the insects can fly so that the fish can dry unspoiled. You can see one of the huts swimming out there. The photo was taken in August 2011, in the middle of the night. Which is not so bad, since the arctic summer keeps the nights nice and light. In the posting below you can see an HDR of a fish drying hut on land with explanation and a link to a cooking site talking about Hardfiskur and Hákarl.